One of the most exciting things as a bird watcher is the rare bird. If it falls during the right season, or the bird is particularly rare, it can create a flutter (pun fully intended) of great proportion in the world of bird watching. One of my fondest birdwatching memories happened during the 2013 Rio Grande Valley Birding Festival, and demonstrated the perfect confluence of timing and a bird of “mega” rarity status. The bird was an Amazon Kingfisher, found on the second-to-last day of the festival. Given that it was only the second American Birding Association record of the species found in the area, many of the scheduled field trips made last-minute route adjustments, and festival participants flooded to a resaca (a waterway similar to an ox-bow lake) in Cameron County. It was amusing, exciting, and frankly a little bit of a safety concern being in that excited crowd of birdwatchers. We waited patiently for the bird to reappear, chatting and exhibiting the general social nature of these rare bird sightings. Soon enough, the kingfisher was seen flying toward us, low over the water. The safety concern came in when the bird flew across the road to the other section of the resaca, and was quickly followed on foot by the horde of birders, who from my recollection, paid little more than lip service to checking for vehicles. Not much later, the bird flew back across the road, and again was followed by the eager avian enthusiasts. Over the next few days it got the point where local county sheriff’s deputies came out to help slow the traffic passing by, all because of one 12-inch bird. The mango is a large hummingbird that hadn’t been seen in the United States since 2009, and only recorded about 20 times prior, and the Blue Bunting (similar in size and general appearance to the abundant Indigo Bunting in much of the eastern half of the U.S.) has only been recorded 51 times. 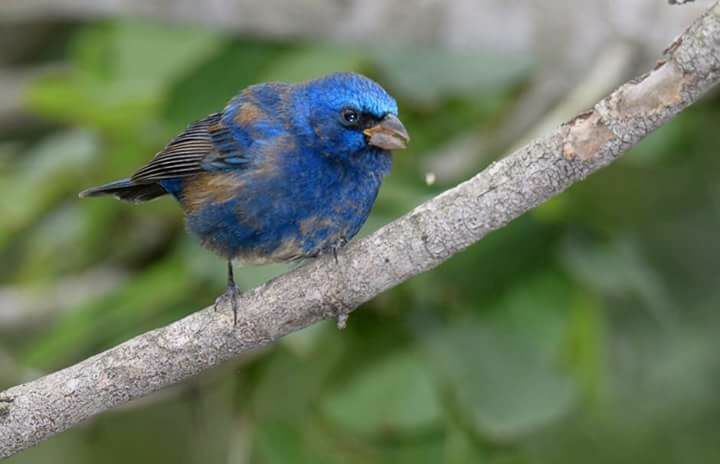 While the mango left after a little over a week from its early December discovery, the Blue Bunting filled the rare bird void a few weeks later on Dec. 30, and remains on-site as I write this. Now, to find rare birds is just that: rare. These are birds that exhibit one or more of the following — out of their normal range, have a small population size or are out of season. It helps to have experience with local birds, to know that something is “different” about it, and it helps even more if you’ve had previous experience with the species, but really it depends on the small chance of being at the right place at the right time. It also takes some luck in whether they stay in the vicinity, so that after the text messages, social media posts, e-mails, and phone calls go out, the bird can be re-sighted by others. While it is lucky to find these individual rarities, on a larger scale rare bird sightings are regular occurrences throughout our region (we’re blessed by proximity to the tropics in Mexico) and around the United States; both having a significant impact on ecotourism. Take the Green-breasted Mango and Blue Bunting as a couple local examples, keeping in mind that they aren’t even mega-rarities like the aforementioned Amazon Kingfisher (American Birding Association Code 5). Those two birds have helped bump the number of out-of-town visitors (staying in local hotels) coming to Quinta Mazatlan from 337 in from December to February in 2016-17 to 2,303 during the same period in 2018, roughly 7 times greater. As part of a continuing survey, we calculated this led to a 79-percent increase in economic impact, and that roughly 81 percent of these visits are birders. All that just represents out-of-town visitors staying in hotels — we also have Winter Texans who are encouraged by the cooperative nature of the Blue Bunting (you just have to sit at a feeding station and wait) along with locals who may visit the park multiple times to get better views of the bird. Another advantage of rare birds is what I like to call the “many-eyes” effect. As more birdwatchers arrive to find the one rarity, it often follows that other interesting birds are spotted as well. Most likely these additional birds aren’t as unusual as the original rarity, but they may either add extra incentive to visit, or drive repeat visits. For example, while the Blue Bunting has frequented our grounds, we’ve also had visitors spot a Townsend’s Warbler and two Western Tanagers, both of which are rather uncommon during winter in our area. It also encourages out-of-town visitors to check out other local nature centers. Quinta Mazatlan offers a hand-out that promotes the other World Birding Center sites. Our staff also give word-of-mouth recommendations, helping to grow the local nature network. A 2010 report done through Texas A&M University and their AgriLIFE Extension helps show the large impact of nature tourism in the Rio Grande Valley as a whole; a total county-level impact of $463 million dollars and over 6,600 full- and part-time jobs annually. We know the importance of birdwatchers to ecotourism, and therefore the value of rare birds, so the question becomes; how can we get rare birds to our sites? Unfortunately, it again is mostly luck. But I believe there are a couple ways to increase your odds. First, get a qualified birdwatcher to dedicate time to really birding your area regularly, aside from regularly scheduled bird walks. This person could be a staff member you hire or a local birder who is willing to volunteer their time (as birdwatchers often are). Second, remember that rare birds have all the same requirements — food, water and cover. Quinta Mazatlan is a relatively small urban woodland (20 acres), so we try to increase the diversity of habitats on our grounds while still maintaining our thorn-forest origins. It is a great responsibility to steward our habitat so that future generations can find more mangos and enjoy the Great Kiskadees, Green Jays, Altamira Orioles and many other birds that live in and migrate through the Lower Rio Grande Valley of Texas. Rare birds, and the ecotourism they promote, help accomplish that feat. For more information about birds, backyard stewardship and more please visit www.quintamazatlan.com. John Brush is a Urban Ecology at Quinta Mazatlan.